This is a unisex fashion show that is where the concealed is revealed. Join us and see a pretty good snapshot of who, how and where to carry concealed. This is a fun event where a serious topic is handled, and you get answers. Have you ever thought – what does that type holster really look like when you are wearing it? What about that matter of carry on a person that is my size? What carry options are there really out there? Can I carry wearing business dress? What about a dressier occasion?Have you struggled with carrying concealed AND looking good? Those questions and more will be answered at the Unisex “Fashion & Firearms; where concealed is revealed” Concealed Carry Fashion Show – Saturday evening, April 27th. As responsible gun owners. We have gotten training, selected a firearm and now are contemplating the carry options. Join us in a firearms friendly and enjoyable event where questions are answers, products looked at and a fun time is had by all. Indiana State Rifle and Pistol Association – girls with guns, and REALIZEfac want to assure you that your carry choice CAN fit into YOUR Fashion! Let us show you some options! 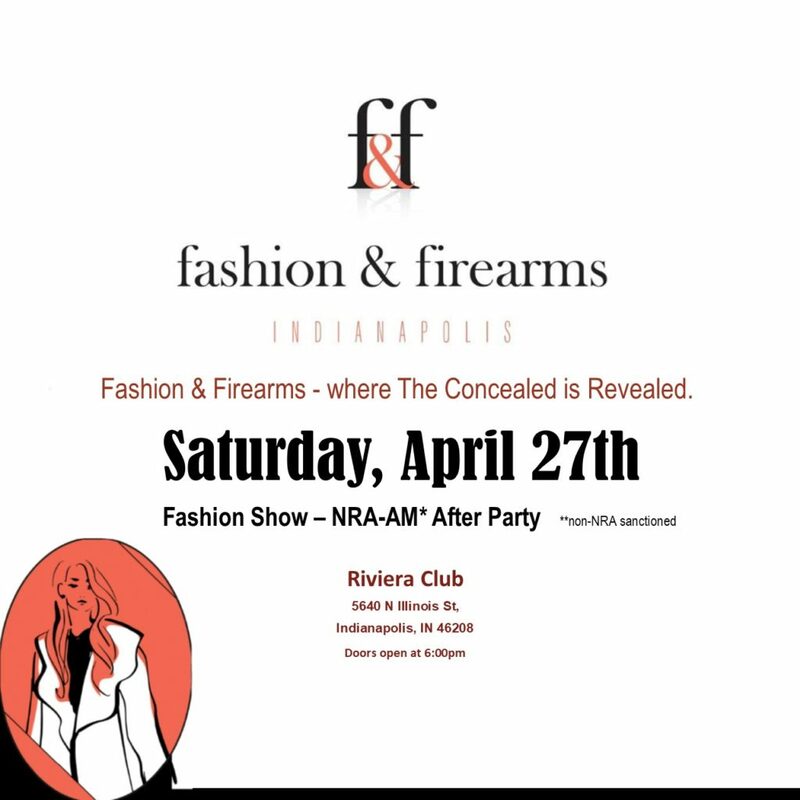 Tickets are on sale now for Fashion & Firearm event to be held on Saturday April 27 at the Riviera Club in Indianapolis! This will be the “After Party” of the year! Doors open at 6pm, right after the NRA- AM*. Delicious Hor D’oeuvres. cash bar, meet & greet vendors– and a Fashion Show with outstanding models demonstrating a variety of Concealed Carry options! Not to name drop but we have some names in the firearms world that have volunteered as models and our show sponsors include Hiding Hilda, Tactica Defense Fashions and Gun Tote’n Mamas.